Miyamato Musashi is well known amongst martial artists as a great swordsman of sixteenth- and seventeenth- century Japan, but how many have ever heard of his Italian contemporary, Ridolfo Capo Ferro? For those with an interest in the European counterparts to kenjutsu, jujutsu, and the other warrior arts of Japan, "The Martial Arts of Renaissance Europe" by Sydney Anglo is well worth picking up. Though suffering somewhat from a lack of perspective, the book still provides a good overview of European fighting systems as they existed from the late Middle Ages to early modern times, and as their teaching and practice related to society at large. 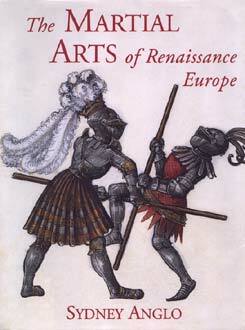 Accordingly, while some of those who have spent years and decades studying fencing and other Western fighting arts may disagree with some of Dr. Anglo's conclusions, his book still provides the general reader with a decent introduction to the arts of war and self-defense as they existed in early modern Europe and one view of conclusions to be drawn from them. Dr. Anglo introduces us to such people as Pietro Monte, acquaintance of Leonardo da Vinci and trainer of the best warriors of Renaissance Italy; Hans Talhoffer, master of a fifteenth-century system of German swordsmanship that has been compared in complexity and depth with Japan's most famous schools of swordsmanship; and Jeronimo de Carranza, a sixteenth-century Spanish nobleman whose geometrical conceptions of swordsmanship have passed into legend as the "mysterious circle." This is fascinating reading for those previously unaware of the variety and history of European arts. Anglo addresses various subjects, such as the place of the fencing master, the teaching of martial arts in society (a subject perhaps better treated by Arthur Wise's "Art and History of Personal Combat") and the pedagogical problems related to the notation and illustration of movement in combat manuals. His answers to the latter question are interesting, and certainly of interest to those who practice and teach Asian martial arts. He also deals with the use and practice of such weapons as swords, staff weapons, knives, bare hands, and mounted combat with swords and lances. However, in today's society, the term "martial arts" unfortunately all too often means simply "that which enables one to dispatch any opponent quickly and efficiently." Whereas there is a growing awareness that there is much greater depth and beauty to the martial arts than mere kicking, punching, and bone-breaking, some of Dr. Anglo's conclusions seem to have been fueled by this popular modern misconception, without specific reference to the norms of Renaissance Europe. For instance, in his final chapter on "duels, brawls, and battles," Dr. Anglo seems to say that there is indeed little difference between the three scenarios, and compares the civilian martial art of rapier fencing to commando-style "all-in fighting." Regardless of the fact that the true intention of the skillful use of the rapier is to keep the adversary at distance and kill him there, this attitude is contrary to some of the best thinking on the subject. J. Christoph Amberger has pointed out in his "Secret History of the Sword" that there is a definite difference between combat in war and personal combat fought under a set of rules, and between mass combat and the predatory, cold-blooded dispatching of an adversary. Perhaps a study of hopology, or a perusal of Donn Draeger's works, would have stood Dr. Anglo in good stead. Still, read with an open mind, "The Martial Arts of Renaissance Europe" is a good read, and a useful introduction to the subject.